The Bulls got a home run, three triples, and two doubles, all by players not named Dan Johnson. The other Johnson, Elliot, got the home run in the first. J. J. Furmaniak, Desmond Jennings, and Omar Luna got the triples. Chris Richard and Dioner Navarro got the doubles. Dan Johnson did draw a walk and scored on the Navarro double, so he did make it into the stats. But Nature was very much a player in the game. 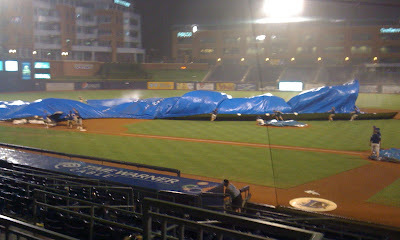 Beginning with crowd-diminishing heat, 95° with a heat index of 107°, and finishing with a tarp-billowing storm that challenged the crew. In fact, they were lucky that there weren’t any injuries. 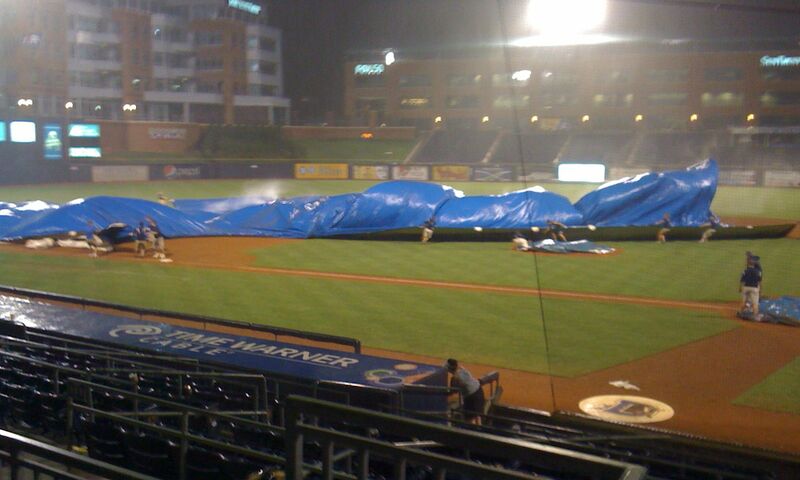 We left once we could get through the rain to car, expecting that the field would take a good bit of time to get back into shape and that at 5-0, bottom of the 8th, two Bulls on base, we had a pretty good shot at winning the game no matter what the umps said. They called the game half an hour later, about the time I was pulling into the driveway. Richard De Los Santos had a terrific game. Charlie Montoyo was reported as saying after the game that, as a former reliever, De Los Santos was on a 6 inning/90 pitch limitation. That makes a lot of sense. What seems odd is that he’s just letting us know this after De Los Santos has made 16 starts for the Bulls. Charlie is nothing if not tight-lipped. Nevertheless, a fine game. Less encouraging was Darin Downs’ appearance. It was the first time the young left-hander had come to the mound since a 2 inning, 2 run, 4 walk appearance the first game against Columbus last Monday. He came on at the top of the 7th inning. He got a ground out, gave up a single, got a fly out, gave up another single, and was pulled from the game for Joe Bateman. At the time the Bulls were ahead only 3-0, so with men on first and second, the tying run was at the plate. Here’s the odd part: In our observation of Charlie Montoyo over the years, when it comes to a situation where he has to choose between seeing how a young pitcher deals with a tough situation or trying to ensure a win, Mr. Montoyo usually goes with leaving the pitcher in the game. In fact, we “experts” in the stands often think he leaves pitchers in way too long. So, why pull Downs in this situation? More than that, if we aren’t going to pitch him, why is he here? (12 innings since he came up on June 23rd.) Don’t get me wrong. I would much prefer a Bulls win. I’m just a bit puzzled with how Darin Downs is being handled. Tonight is the last game before an eight game road trip. With one of the most secretive front-offices in baseball, there’s no telling what the Rays might be up to as July comes to an end, but the team that comes back from Lehigh Valley and Pawtucket might not be the team that is playing tonight. I am thinking that the Rays won't do much in the way of trades. Maybe I am wrong, but they always talk big and then back off. That said, I think they will bring up Hellickson sooner rather than later (there is some Rays blog buzz about him for the bullpen in September). Thanks for the link, I've put it up. If the Rays have a weakness at all these days it's the starting pitching and, mildly, the outfield. If they could pull off something for a mature starter, I think they might. But haven't heard of anyone in play (that they could afford). So, agreeing. Plus they never seem to have cared about the "deadline". They'll trade, it seems, almost any time. There was a post on mlbtraderumors this morning about how the Rays are looking to trade prospects, not MLB-ready players, but all the players they mentioned (just as speculation on their part) are lower in the system and nothing that would change the current Bulls roster. Hard to say, though. I have to think that the Rays know they are not going to have as good a team next year and they might be tempted to go for broke this season.